This interview was first published in Viewpoint: On Books for Young Adults Spring 2000, Volume 8 Nº 3 It was published on the occasion of the release of Nukkin’ Ya, the sequel to his award winning debut novel Deadly, Unna? Go here for a review of Deadly, Unna? 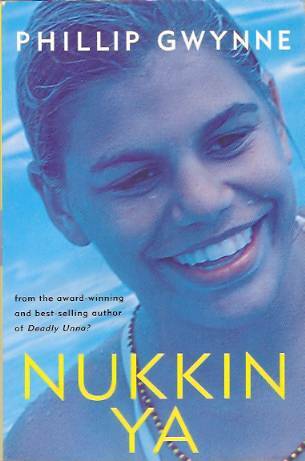 In 1998, I was asked to review Phillip Gwynne’s Deadly, Unna? for this journal. I don’t know if other critics feel this way, but I often take a proprietorial interest in books I’ve reviewed — especially the ones I’ve loved, and especially if they’re by a new author. I ask booksellers how they’re selling, I keep a watchful eye out for other critic’s opinions, I watch their progress in literary awards. And I look out for new works by the author. Gwynne’s sequel to Deadly, Nukkin’ Ya has been as well-received as its predecessor. I didn’t get to review this book, but I wanted to talk to Gwynne about his writing. He was kind enough to indulge me. One of the great pleasures of reading Nukkin’ Ya is being back in Blacky’s company. You’ve captured his voice again perfectly; yet he’s changed, too. He’s matured, his observations of people are as shrewd as ever, but he’s lost some of the naïve jocularity that characterised him in Deadly. How did you “find” Blacky’s voice in the first instance, and how was it revisiting him in the second book? Blacky’s voice started in something I wrote that was based on my own life. About growing up in the country, being in a big family, playing footy. Then it occurred to me one day that I could use that voice (or something close to it) to write a story, to write fiction. It’s then that the voice started to change, became somebody else. It’s funny, I have vivid mental pictures of all the characters in the Point and the Port, except for Blacky. He has no face, no body. I didn’t find it very difficult to find the voice again. To tell the truth I could probably keep writing in that voice until the cows came home. That’s why, initially, I was very reluctant to write a sequel to Deadly, Unna? I wanted to move on, experiment with different voices, different characters. But Blacky wouldn’t leave me alone. There are certain similarities between the details of Blacky’s life and of your own — do readers assume the books are autobiographical? Where do you draw the line between drawing on your own experiences and fiction? It’s an easy assumption to make. Blacky is one of eight kids, so am I. He grew up in the country. So did I. The central event in Deadly, Unna? — the Aboriginal kids getting shot in the pub, actually happened. Blacky’s world is (or was) pretty much my world. But he’s not me. I guess you stop using fact and resort to fiction when you need to — when the story needs a hurry-up, when something needs to happen so you invent it. I don’t remember reading many non-Aboriginal authors who depict Aboriginal characters, and the interaction between Aboriginal and non-Aboriginal characters so easily, so naturally as you do. Often the depiction of Aboriginal characters seems awkward and self-consciously “respectful”. In your books, these relationships read so naturally that I imagine it must be because you grew up knowing Aboriginal people as people, rather than as a cause. I didn’t know Aboriginal people that well. I only lived in that town from ages 7 to 13 and the only time I got to hang out with Nunga kids was on and around the footy ground. But I have spent a lot of time overseas, and have got to know people from other cultures pretty well so maybe that’s got something to do with it. I’ve never been keen on causes, even during the 70s when it was de rigueur. As for ideologies I’ve always been very suspicious of them. Which is not to say that I don’t believe in things, and that I’m not passionate about them, it’s just that I don’t need a vehicle for that passion. I always thought Deadly was set in the 70s, but the cultural references in Nukkin’ seem much more contemporary — “Home and Away” and body piercings for instance. Yes Deadly,Unna? is set in the 70’s but not strictly so. A lot of the cultural references (pollywaffles, Brady Bunch) are from that era, but if you look closely you’ll find many things that don’t belong to that era. For example, the kids says “heaps” — that was never part of the vernacular then. You’re right — the cultural references in Nukkin’ Ya are even more jumbled. I was never after historical veracity however. Emotional veracity — yes, but not historical. I haven’t thought about this much but how about this for an explanation — I didn’t want Deadly and Nukkin Ya to belong to a period because then people could say that those attitudes prevailed back then. As you and I know those attitudes did prevail back then, but they also prevail now. So why didn’t I set it now? Maybe I wasn’t confident writing about kids now. The really funny thing is that many people have told me that I’ve got the language right, that’s how kids talk now, but the kids I was writing about were 70’s kids (except for the “heaps” and other bits that I dropped in). I’d suggest that’s because your use of the vernacular is character-based, rather than an attempt to give the writing a faux authenticity. You’ve written the screenplay for Deadly; what differences have you found in writing for the screen compared to writing prose? And how did the screenplay influence the writing of Nukkin’ Ya? I wasn’t really writing for the screen, I was adapting for the screen. I don’t think I could write a screenplay from scratch. I love language too much, and in a screenplay language comes behind character and plot and those sorts of things. But it was an enjoyable process for most of the time. I think I learnt some valuable lessons about plotting and as a result I think the plot in Nukkin’ Ya is much stronger than the one in Deadly, Unna?. Several of the reviews of Nukkin’ Ya have expressed hope for a third novel about Blacky and Clarence, and there certainly seems to be more story left to tell about their lives — are you interested in taking them further, or do you want to take your own writing on a new adventure? Well put! I’m going to stop pestering Blacky, Clarence, Pickles et al for a while and let them get on with their lives. I’m writing an adult’s book at the moment and I made a very deliberate decision to write in third person — I don’t want Blacky trying to sneak in while I’ve got my guard down.